Posted on February 1, 2014, in Eurovision 2014, Melodifestivalen and tagged Alvaro Estrella, Copenhagen, Eurovision 2014, Finland, Helena Paparizou, Linus Svenning, Mahan Moin, Melodifestivalen 2014, national finals, Switzerland, UMK, YOHIO. Bookmark the permalink. 5 Comments. I’ve been following UMK, and with UMK I will stick, mainly because I have grown attached to MIAU and their homemade white felt spiky collars and their electro-80s-headbanger-punk-whatever-that-song-is. With the help of a link from Twitter and Google translate, I even put in a vote for it from California … at least I think I did. (Someone in Finland stole my .99 euros if not!) First time I’ve ever actually cast a vote in a Eurovision thing, and I’m stoked! My crusade against off-key singing is taking a beating in UMK, though, as Clarissa and Josh continue to march through the process. Yes, I know, a lot of people like the studio version, but they – especially Clarissa – are HORRENDOUS live, they will get barbecued by the juries if they make it to Copenhagen, and I don’t understand how there are people out there that can’t hear it. It’s not just me either. The UMK jurors all but PLEADED with viewers not to vote for them in the last semifinal, to no avail. I fear their fans will succeed in throwing them to the wolves, uh, sending them to Copenhagen, to be the next Tooji. I figured Switzerland wasn’t worth paying any attention to (looks like a good call, sorry Switzerland) and just haven’t had time to fool with Melodifestivalin, though hopefully that’ll change. On behalf of every Eurovision fan living outside of Europe, I would like to congratulate you on making a (possibly) legitimate vote happen! Unfortunately for you it wasn’t enough for MIAU. But they did well enough to be featured in many a ‘Best NF Runner-Ups’ post in the near future. I haven’t had the “pleasure” of watching a live of Clarissa and Josh, but based on your verdict I’m glad they didn’t win. I did really like what I heard of the studio version though. Switzerland = really not worth it, as much as I wish they were. I think I’ve finally learned my lesson, and will be steering clear next year. Clarissa and Josh did a little better at the Final than they had previously, but were still the worst act there. Was I the one who over-inflated your UMK expectations? 😉 It’s honestly the strongest Eurovision-related event I’ve ever followed. All the songs bring something different to the table and I could make the case for any of the eight to get the ticket to Copenhagen. It wasn’t just you!! And maybe I’m the problem anyway. You know, like Taylor Swift is to dating. UMK just can’t compare to many a Melfest of the past IMO. 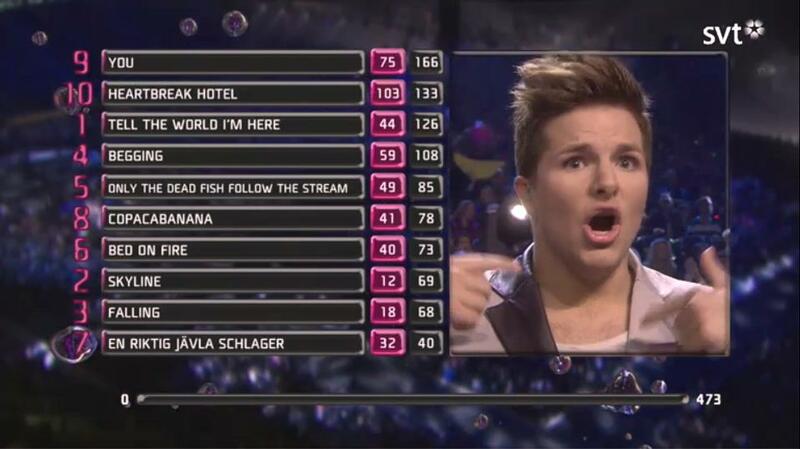 I would marry Melfest if it were at all possible.